In the spring, it is necessary to gain vitamins, it is useful for health and well-being. And of course everyone already misses the light cocktails. So here is a quick recipe for one or the whole family. 1. Let's start with lemons and lime. 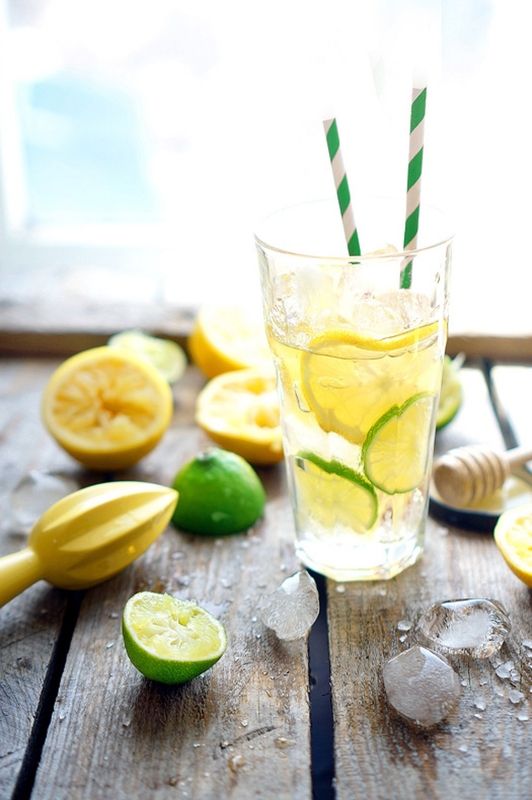 I love their combination, each gives its own notes of flavor and complements each other: if the lemon is more sour, then the lime is bitter, it enriches the lemon taste, strengthens it. Cut the fruit half and cut a few slices from sections – it is for decoration. Squeeze the other halves in a separate glass. 2. In general, there are many theories, where there is more vitamin C – lemons, limes, tomatoes, kiwi and so on. To each his own, I trust lemons and limes more, especially for a light cocktail, they fit most well. 3. Then, add 3 tablespoons of berry syrup in citrus juice, I took raspberries. Firstly, it is sweet enough for combination with citrus fruits, and secondly, it is rich in useful substances. Carefully choose natural syrups without chemistry and flavorings/dyes, otherwise you will do more harm to health, and the taste is far from real berries. After syrup, add 2 tablespoons of honey – it will add sweets, and it is probably not worth talking about the benefit of honey at all. A pinch of sea salt will give a certain amount of iodine, and in addition salt is an excellent natural flavor enhancer. Mix well the mixture and pour mineral water to the top of the glass. You can add a piece of ginger. 4. Now prepare the glasses: put slices of lime at the bottom, 3-5 ice cubes on top, also slices of lemon on top and ice cubes so that they reach the neck of the glass. Neatly pour in the cocktail on top, stir with a high spoon (or fork) and serve the family. 5. I give the ingredients for one serve, respectively, you increase them by the desired number of serves. If a good syrup is not found, you better refuse from it than to use a chemical. 6. Tell us what cocktail you like, what you use as ingredients, which consistency you like more: liquid with ice or dense smoothies?